Separately, a 16-year-old boy was also found suffering from gunshot injuries in the London area last night. File photo of a shooting scene on Ferncliff Road in Hackney. A TEENAGE GIRL who died after being shot in London last night has been named as Tanesha Melbourne. 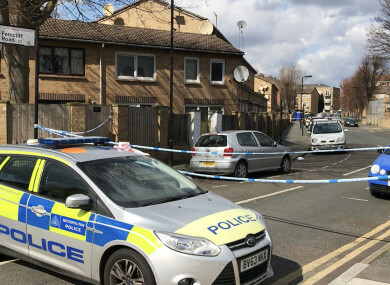 London Met Police said that the 17-year-old girl died after she was found with gunshot wounds in Tottenham. Police were called to the area at 9.35pm after receiving reports of the shooting. Officers attended the scene and found the teenage girl suffering from a gunshot wound. Despite the efforts of emergency services, she was pronounced dead at the scene an hour later. Speaking to Sky News, the victim’s uncle said Tanesha was a “good girl”. “She’s finished her schooling and gone on to work,” he said. She’s never hung around with any gang crime or anything. “We’ve got to stomp on black-on-black crime. We’ve got to educate our youth that gun crime and drugs are not the way forward,” he added. Formal identification awaits and a post-mortem examination is due to take place. Met Police said that, at this early stage, it is believed shots were fired from a vehicle into a group of people, hitting the girl. Detectives are working to establish the type of car and how many people were both in the vehicle and within the group shot at. They said they are keeping an open mind about the motive for the attack. Separately, in Walthamstow, a 16-year-old boy was found suffering from gunshot injuries. He is in hospital in a critical condition. Police were called to the area at about 10pm to Markhouse road, E17 to reports of shots fired. Emergency services were called to the scene, where two boys were found injured. One was found suffering from gunshot wounds while the other had stab injuries. Police said there had been no arrests at this stage for either incident and that they are not being treated as linked. “This crime is absolutely devastating and leaves a loving family suffering unimaginable pain. It is also very frightening for the community,” Chief superintendent Helen Millichap said. “Detectives from the Homicide and Major Crime Command are leading the investigation and continue to work with the local command to identify and arrest those responsible. We are working hard to prevent further violence and keep people safe, by making sure extra officers are deployed to Haringey and to this area in particular. The incidents come as figures showed over the weekend that the murder rate in London has overtaken New York. There were more murders committed in London in February and March than there were in New York. In 2018 so far, Met Police has investigated 46 murders – compared with 50 in the US city. Email “17-year-old girl killed in London shooting named locally as Tanesha Melbourne”. Feedback on “17-year-old girl killed in London shooting named locally as Tanesha Melbourne”.